3. 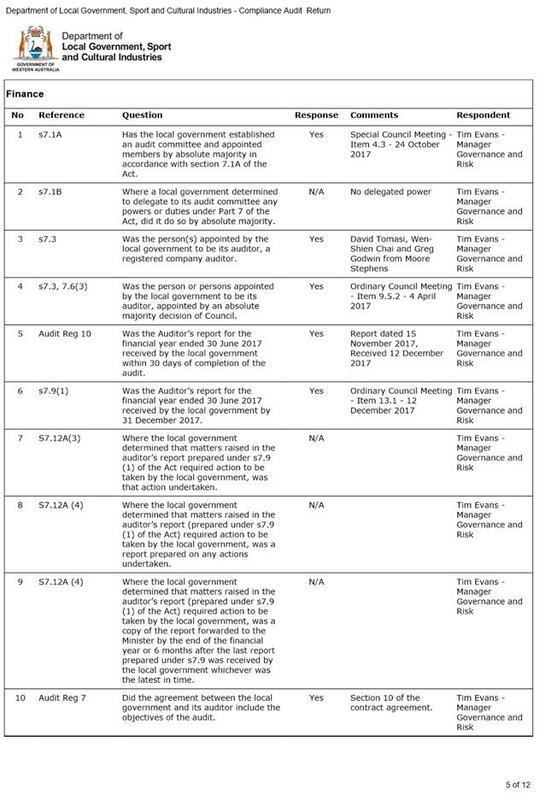 NOTES the recommendations of the Audit Committee in respect to the Compliance Audit Return 2017 which is the subject of a separate item on this Council agenda. 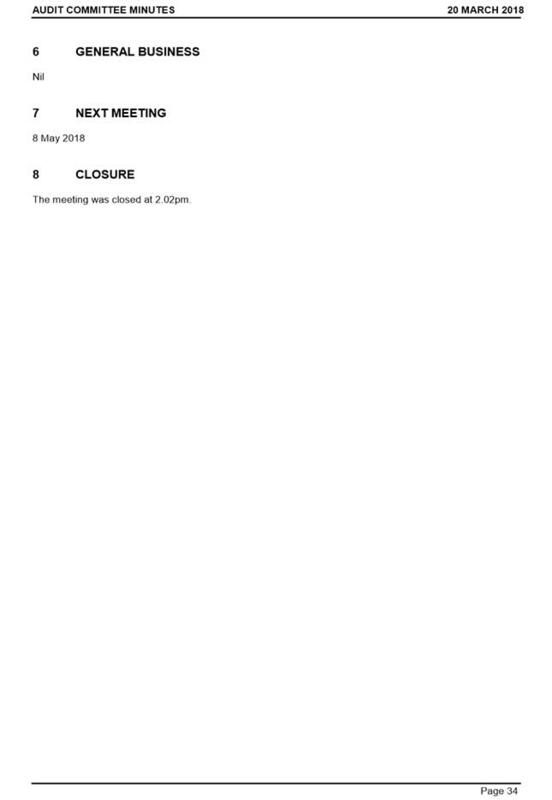 To report to Council the proceedings and transactions of the Audit Committee meeting of 20 March 2018 in accordance with clause 2.21(1) of the City’s Standing Orders Local Law 2008. · Liaise with the local government’s internal and external auditors so that Council can be satisfied with the performance of the local government in managing its affairs. 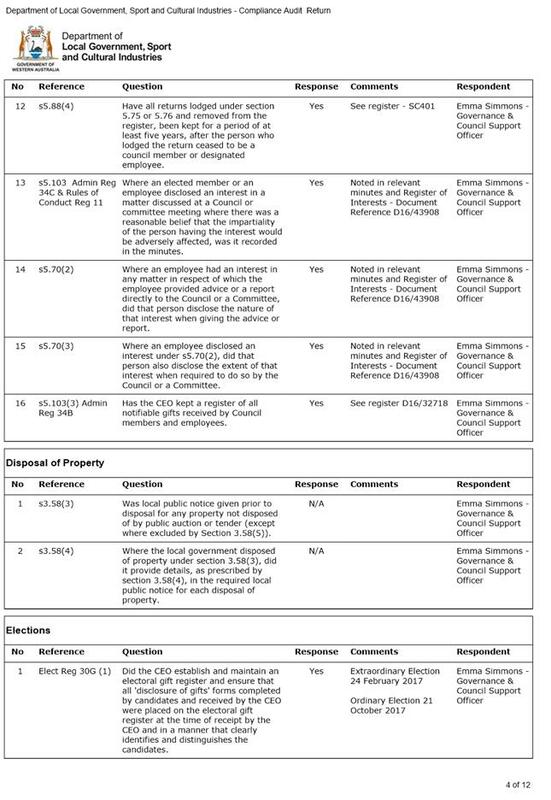 In relation to item 5.1, the committee accepted the officer’s recommendation and has recommended that Council adopts the Compliance Audit Return 2017, noting the single area of non-compliance reported. 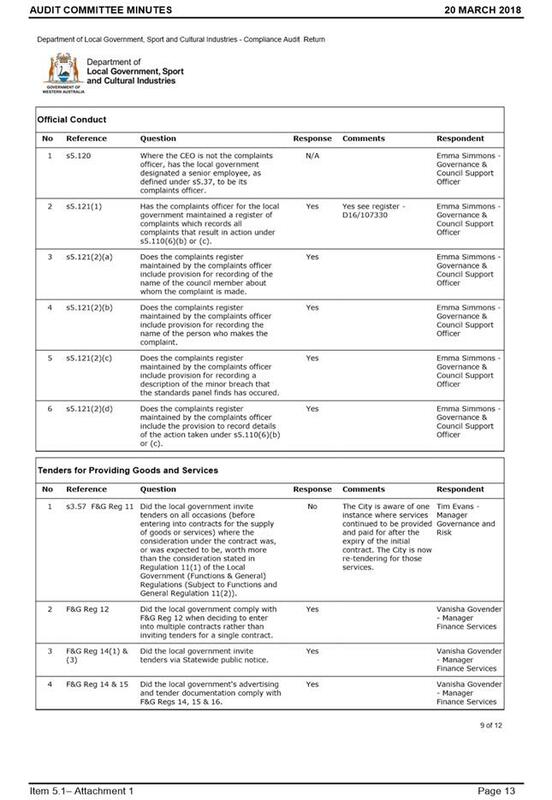 This is the subject of a separate report within Council agenda. 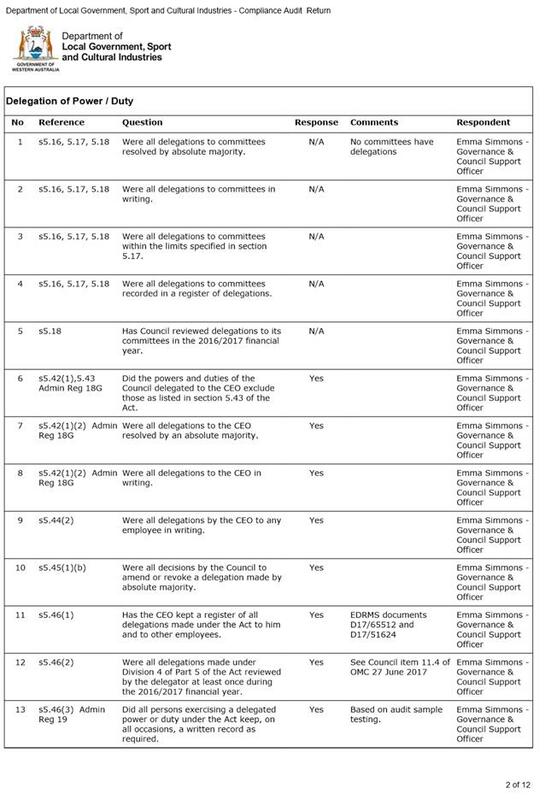 Item 5.2 concerned the biennial Chief Executive Officer’s Report relating to the appropriateness and effectiveness of the City’s processes and procedures with respect to Risk Management, Internal Control and Legislative Compliance. 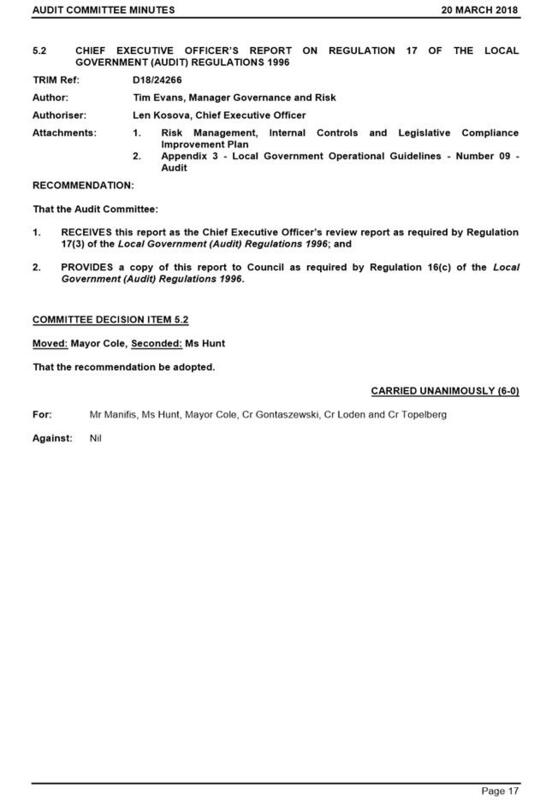 The Audit Committee requested further information from Council Staff in relation to several areas of the report and was ultimately satisfied to receive this report and provide it to Council in accordance with its duties under Regulation 16(c) of the Local Government (Audit) Regulations 1996. 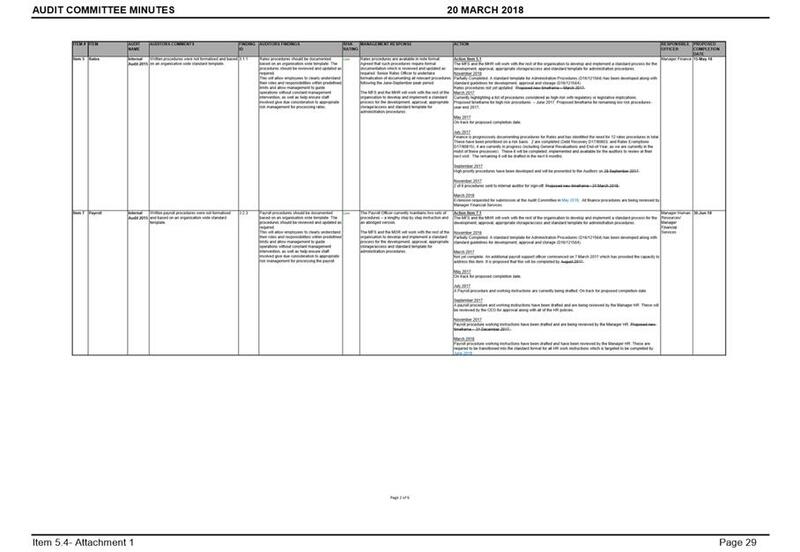 The report is provided in full as part of item 5.2 of the Agenda of the Audit Committee meeting held on 20 March 2018 in Attachment 2. 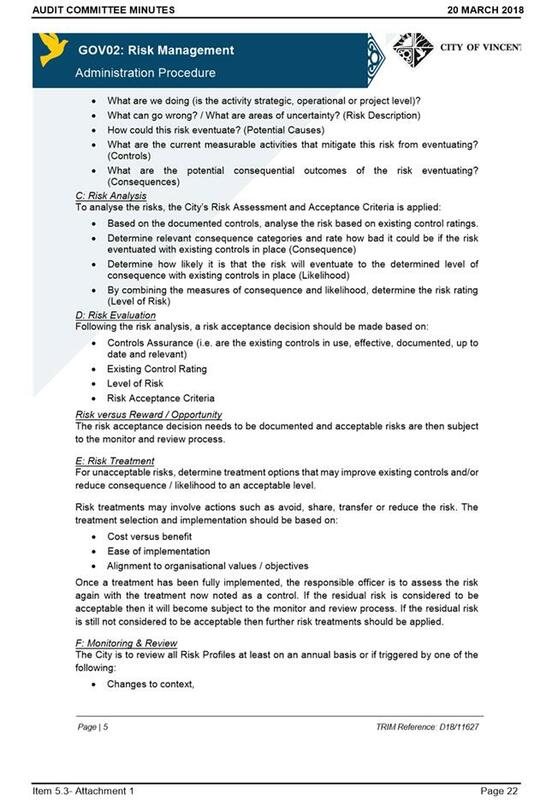 · the City's procedures and systems relating to Risk Management are considered to be improving but still incomplete, lacking in consistency and therefore only partially appropriate and effective. · the City's procedures and systems relating to Internal Control are considered to be sound if not yet exhaustive and therefore largely appropriate and effective. 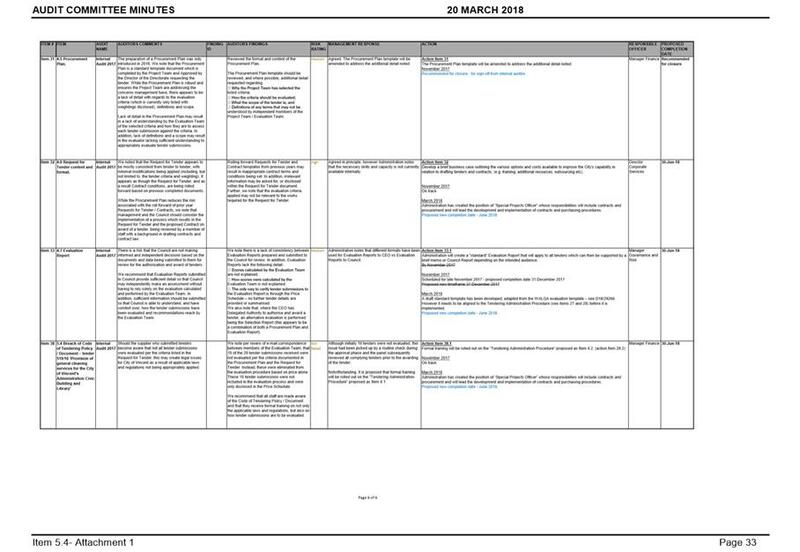 · the City's procedures and systems relating to Legislative Compliance are considered to be improving but still incomplete, lacking in consistency and therefore only partially appropriate and effective. 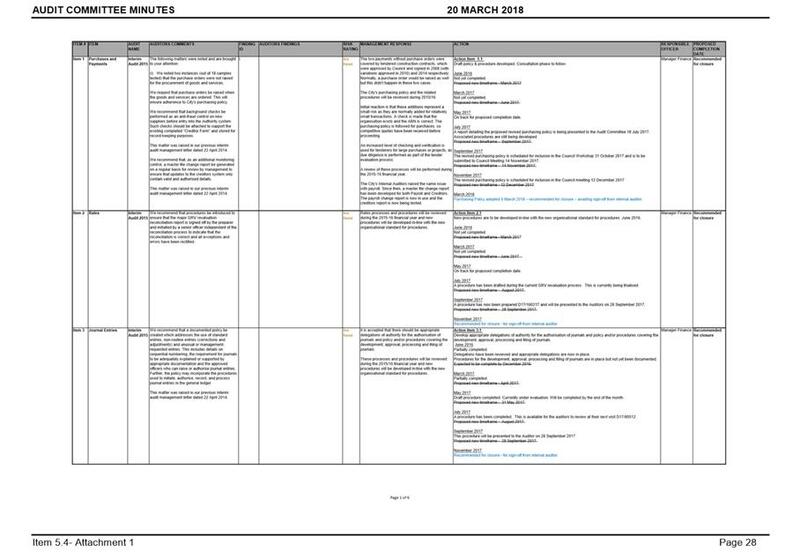 In order to continue the progress made to date, Administration has committed to providing a report to the 8 May Audit Committee meeting to present a revised improvement specifically focussed on Internal Control and Legislative Compliance. 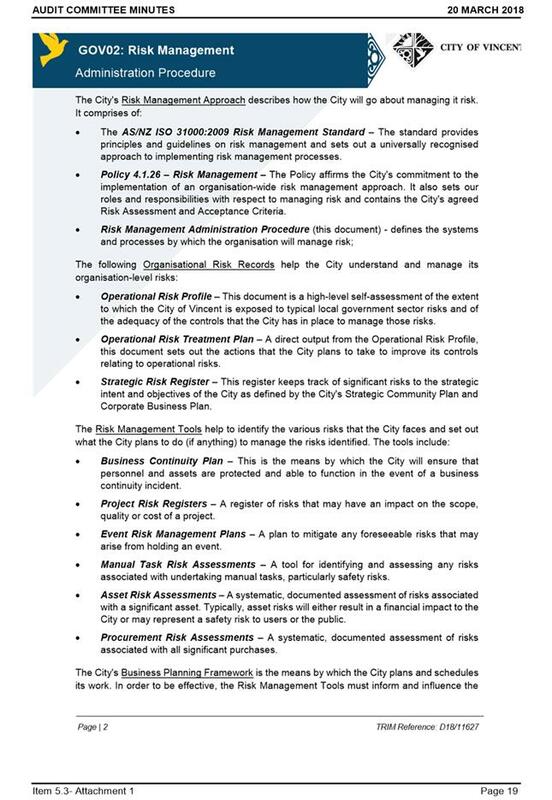 Item 5.3 reported to the Audit Committee a proposed Risk Administration Procedure designed to support the City’s recently adopted Risk Management Policy. 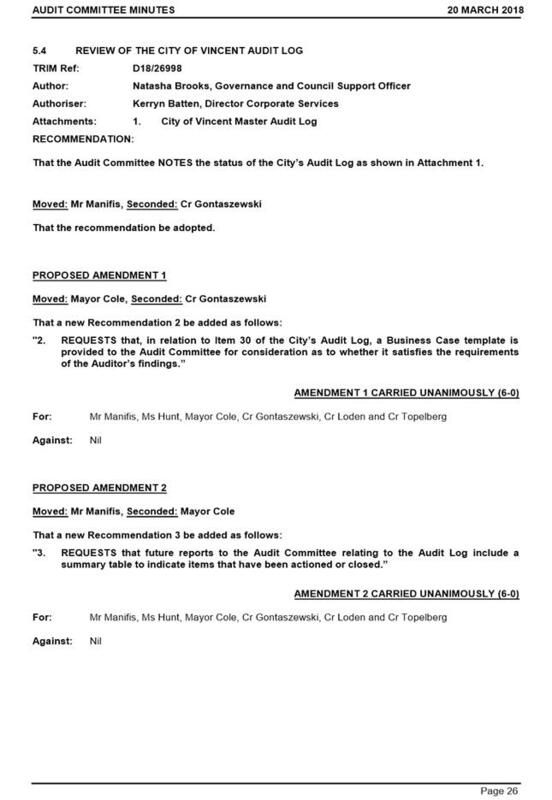 Item 5.4 reported the current status of the City’s Audit Log. 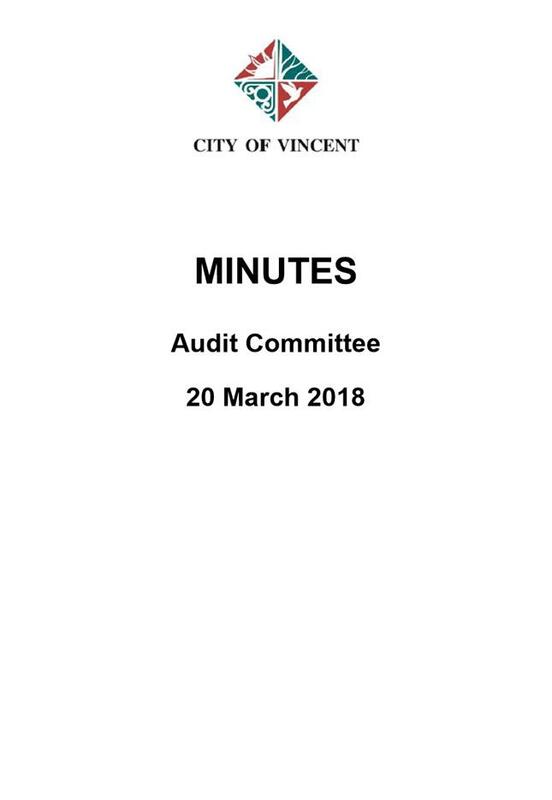 On this item, the Audit Committee raised two amendments, both requesting additional information to assist the committee and to provide additional assurance in relation to the management of the City’s Audit Log. 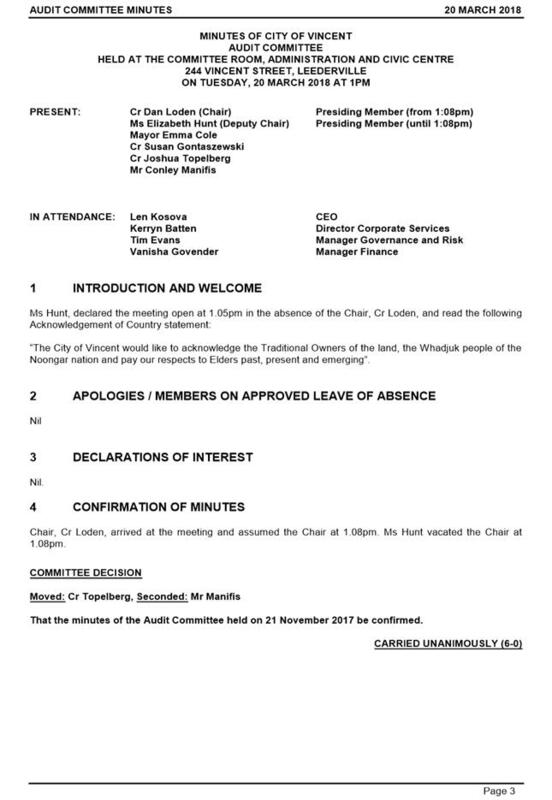 to be presented to the Council by the presiding member of each committee concerned, or in his or her absence, a member of the committee in the form of a motion; “That the report be received and the recommendation be adopted”. 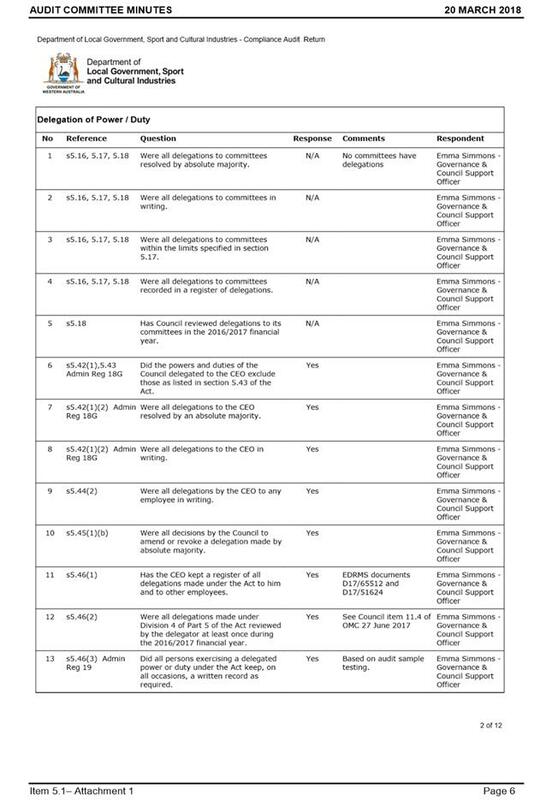 (2) No objection to the receipt of a report of any committee, or any part of it, shall be raised when such reports are presented to the Council, except for reasons arising out of such reports. 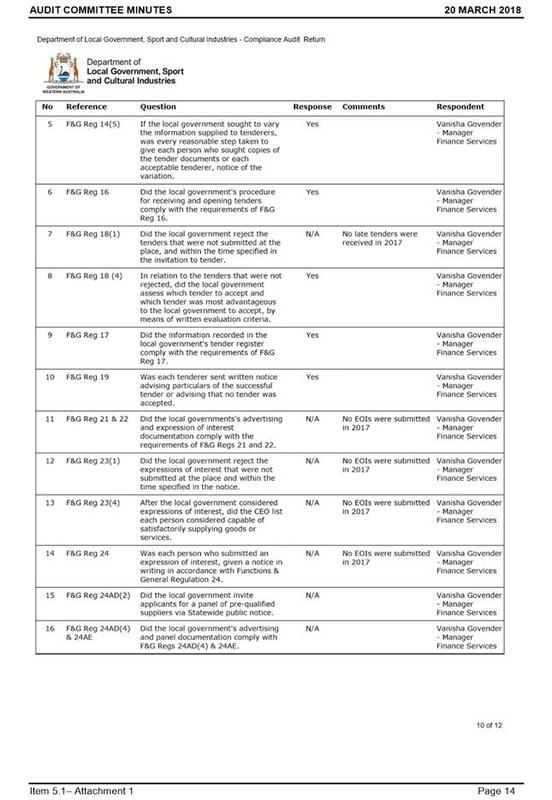 (2) The review may relate to any or all of the matters referred to in subregulation (1)(a), (b) and (c), but each of those matters is to be the subject of a review at least once every 2 calendar years. 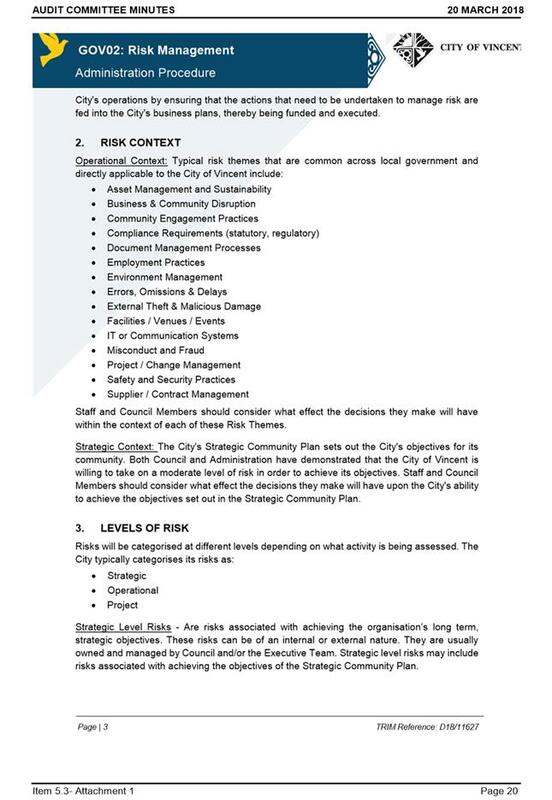 Low: There is no risk associated with Council accepting this report relating to the Audit Committee, however the effective operation of the Audit Committee assists the City to better manage its risks as a whole. 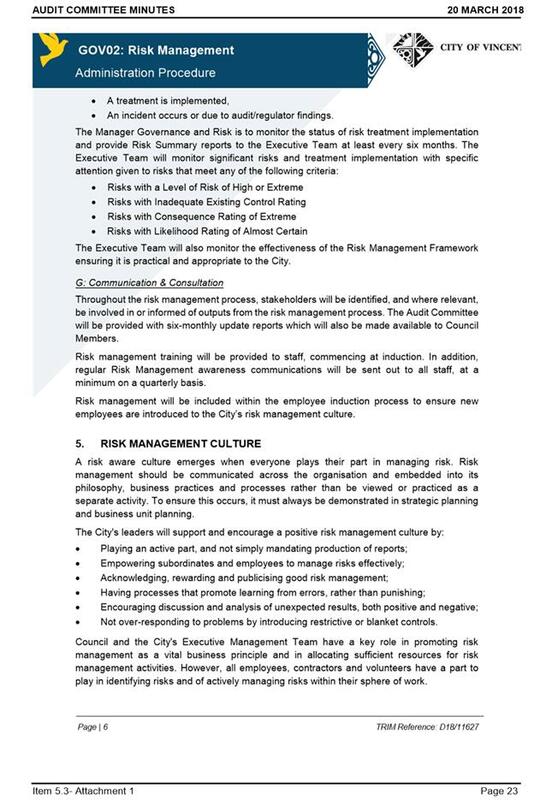 Effective processes and procedures relating to Risk Management, Internal Control and Legislative Compliance will contribute to the overall financial sustainability of the organisation. 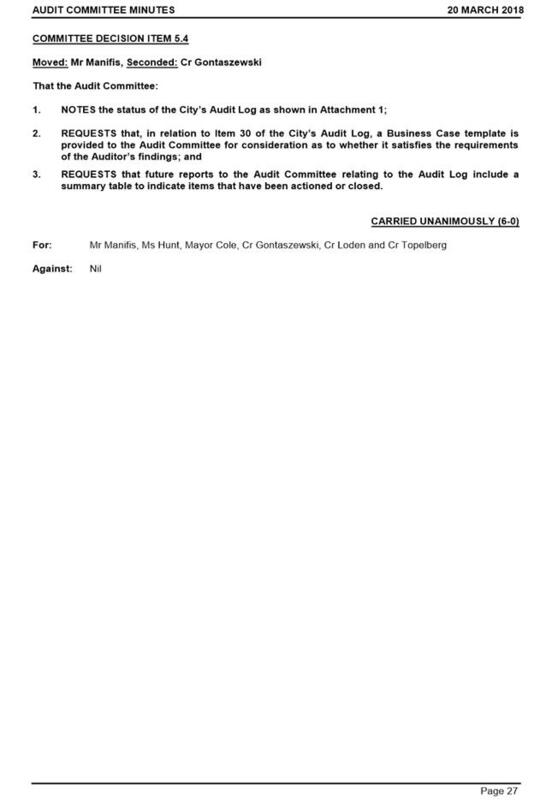 This report is presented to Council in order to inform Council about the proceedings of the Audit Committee. 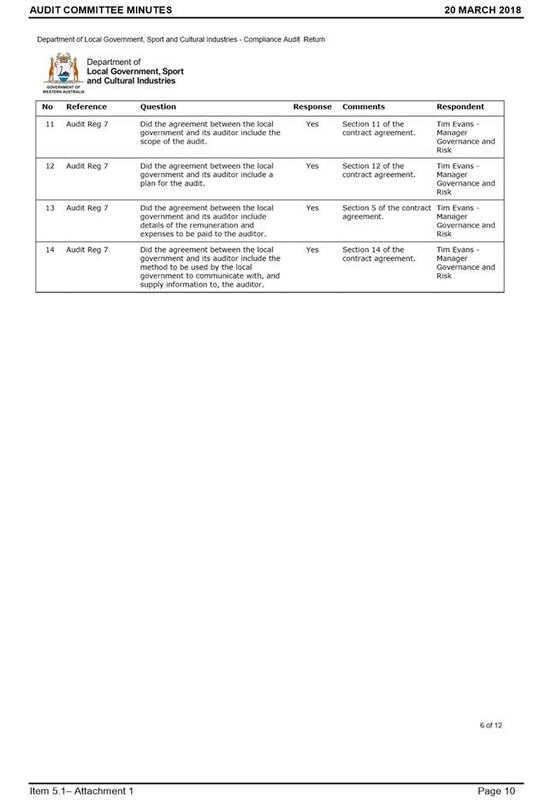 In accordance with the City’s Standing Order Local Law 2008 – reproduced in the LEGAL / POLICY section of this report, the presiding member is to put the recommendation in at least two parts. Firstly, recommendation 1 - that the report be received – is to be put. 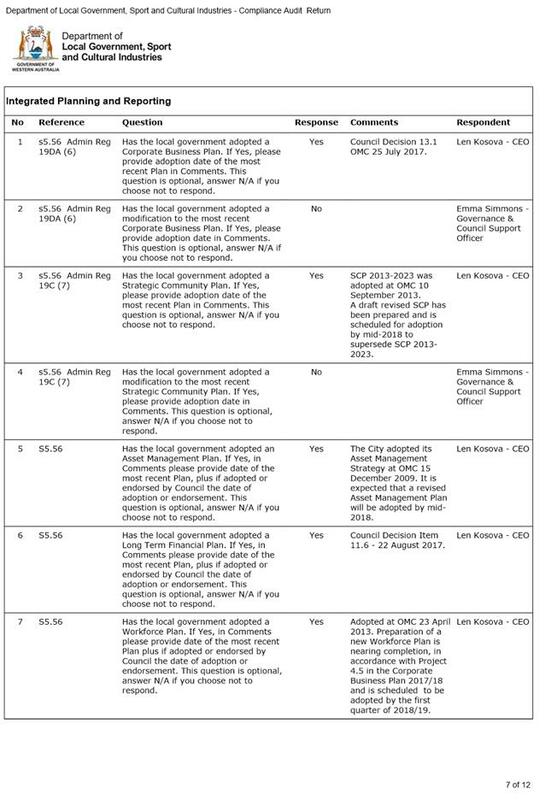 A call is then to be made for Council Members to move any other of the recommendations individually. 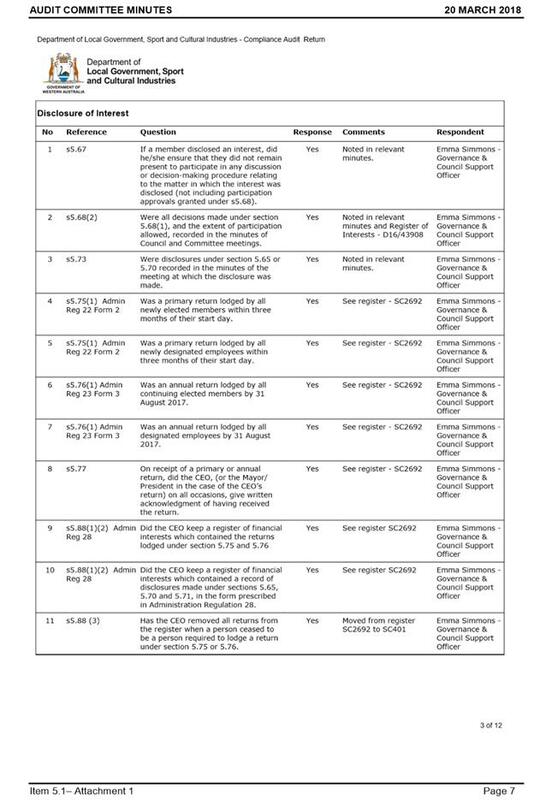 If no mover is forthcoming for any individual items then the remaining recommendations may be put together. 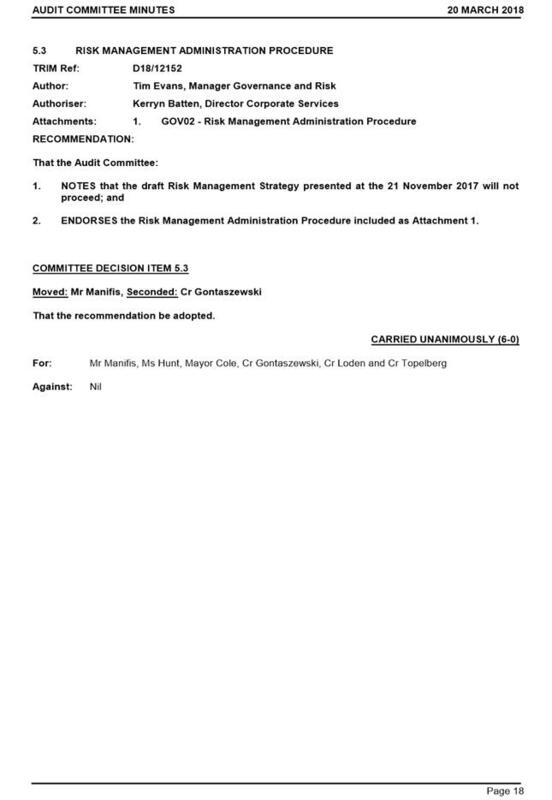 As outlined in the DETAILS section of the report, the Audit Committee has received and considered the CEO’s report on Risk Management, Internal Control and Legislative Compliance pursuant to Regulation 17 of the Local Government (Audit) Regulations 1996. 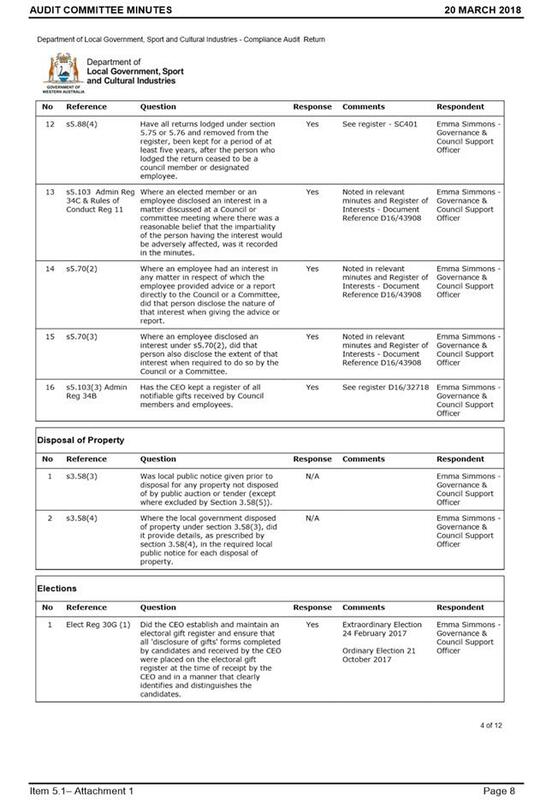 While the Audit Committee is required to report the results of that review to the Audit Committee, there is no statutory role prescribed for Council. 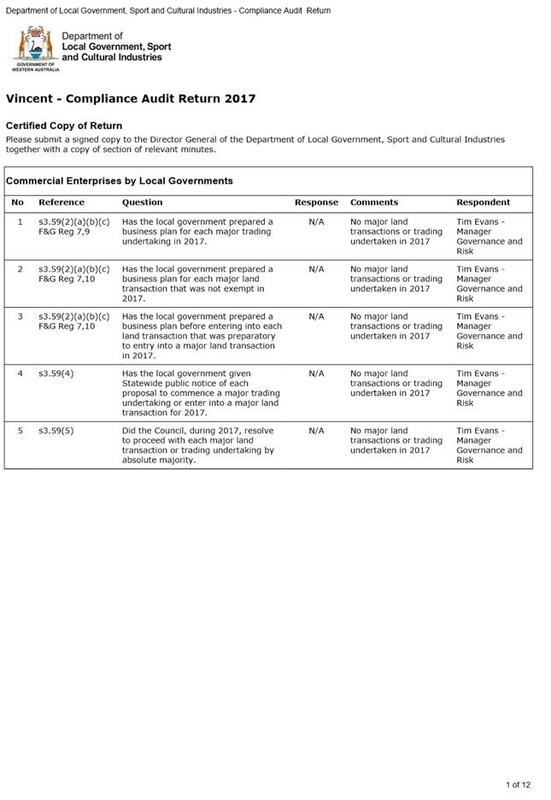 However, it is Council’s prerogative to ask questions of the Audit Committee chairperson or the CEO in relation to the report and to either accept or amend recommendation 2 relating to this review. 1. 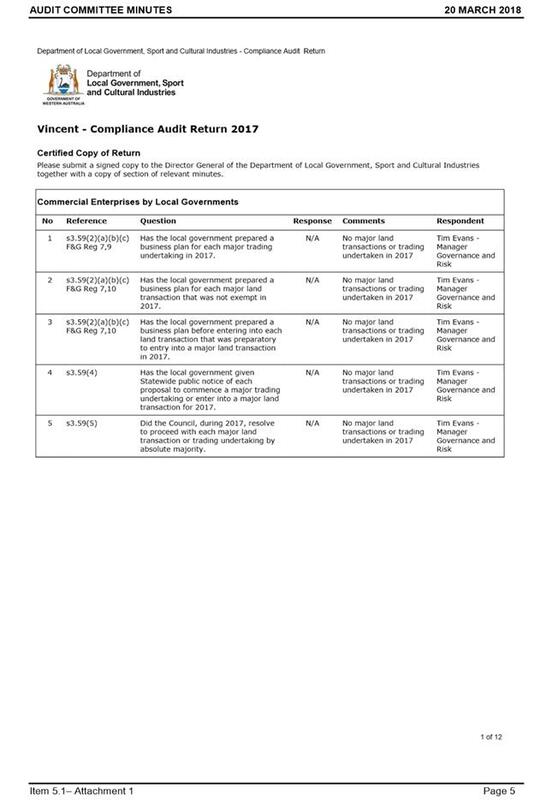 ADOPTS the Local Government Statutory Compliance Audit Return for the period 1 January 2017 to 31 December 2017 noting the single area of non-compliance reported. 2. AUTHORISES the certification to be jointly completed by the Mayor and Chief Executive Officer in accordance with Regulation 15 of the Local Government (Audit) Regulations 1996. 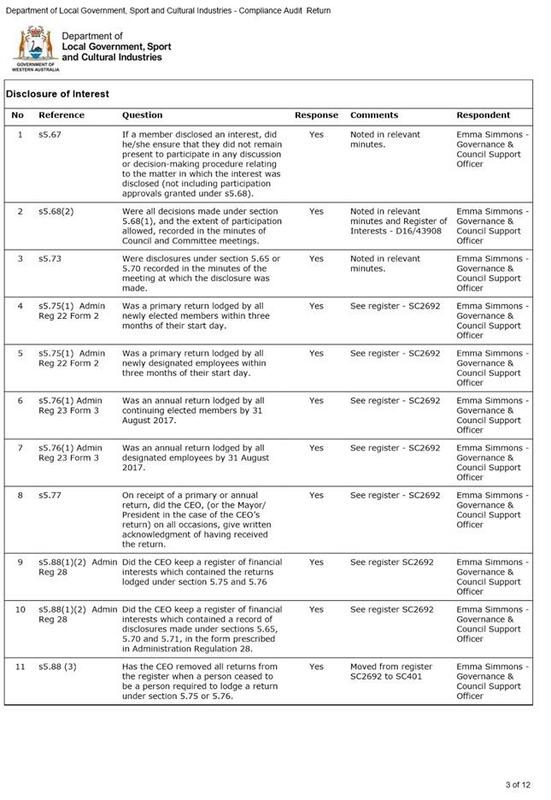 To consider the City's Compliance Audit Return for 2017. 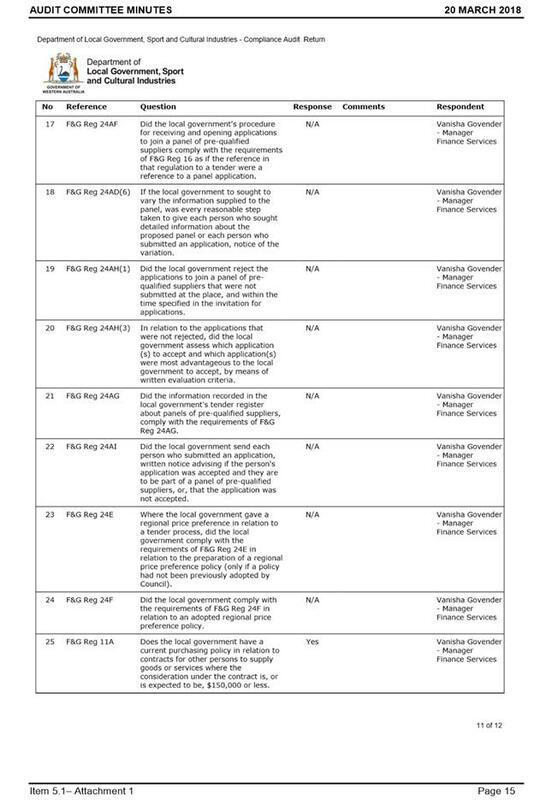 Section 7.13(1)(i) of the Local Government Act 1995 (the Act) requires local governments to undertake an audit of compliance, “in the prescribed manner and in a form approved by the Minister”. 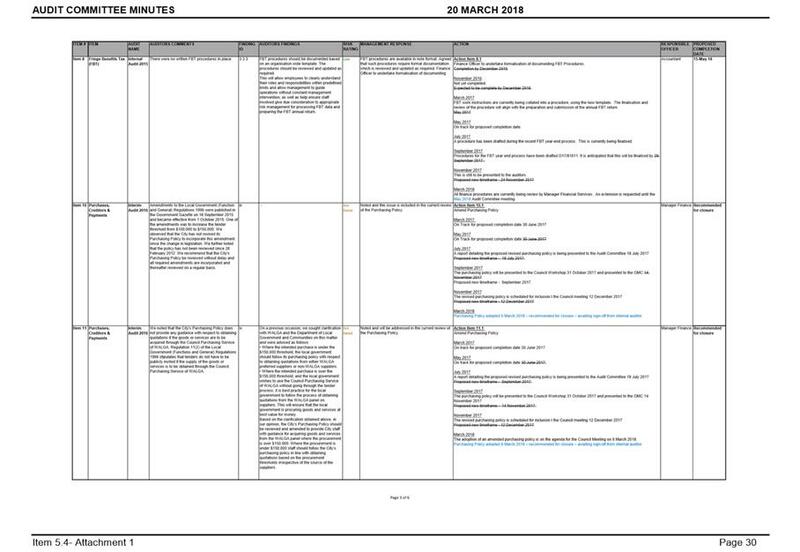 The compliance audit is to be undertaken for the period 1 January to 31 December each year, with the completed Compliance Audit Return (CAR) submitted to the Department of Local Government and Communities (the Department) by 31 March 2018. 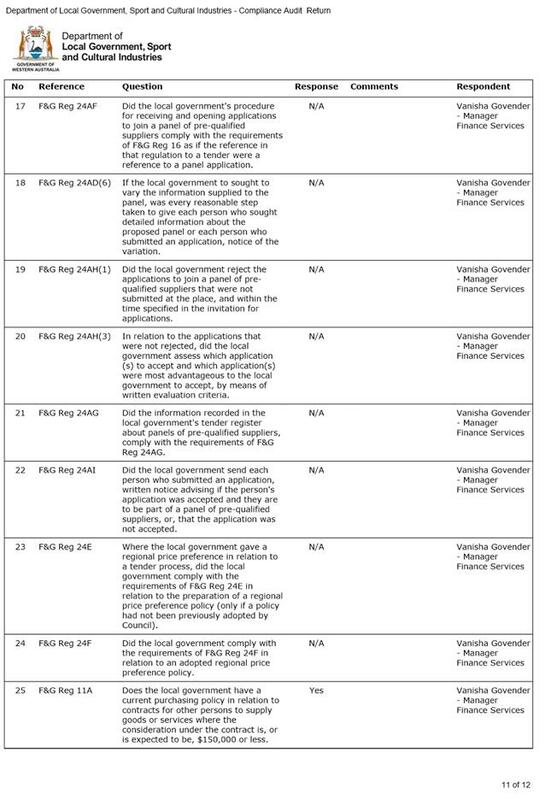 The 2017 CAR deals with the period 1 January 2017 to 31 December 2017 and focuses on those areas considered high risk in accordance with the Act and associated Regulations. 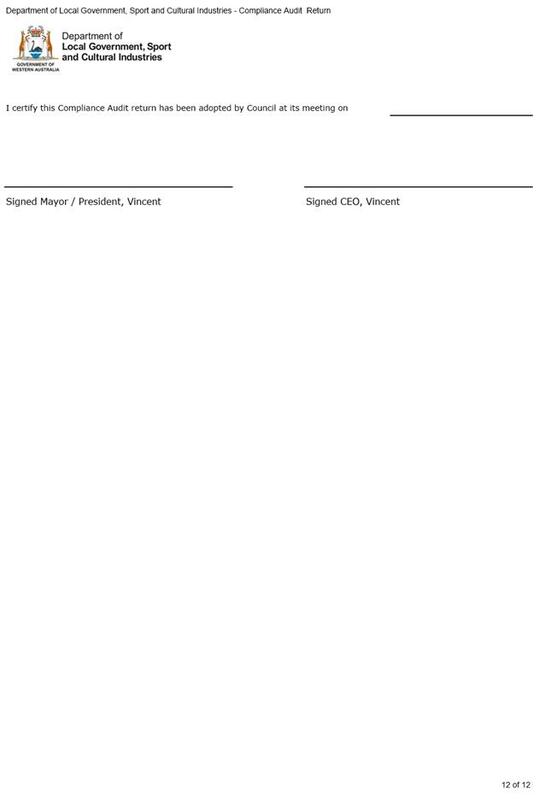 · Tenders for Providing Goods and Services. 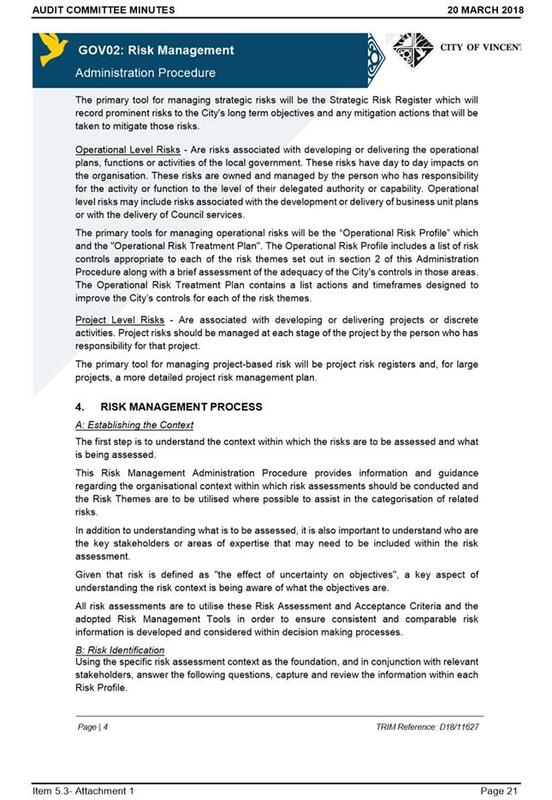 This year there are an additional seven questions to answer about Integrated Planning and Reporting. 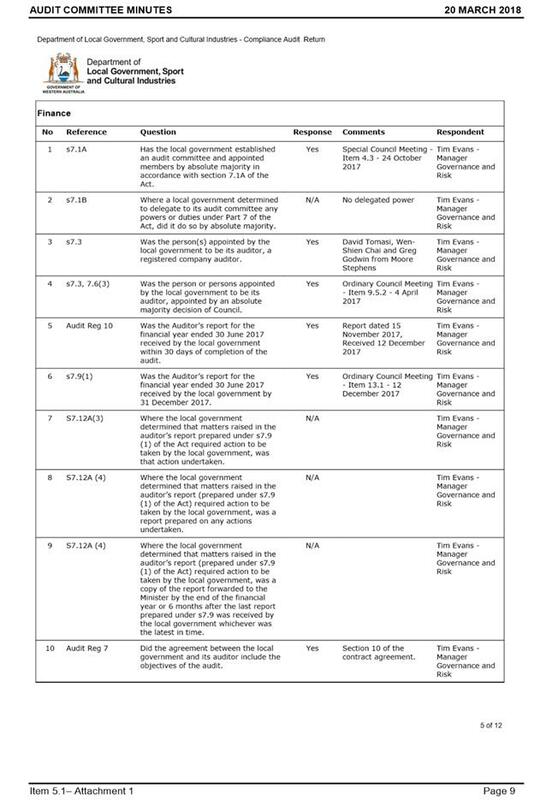 These are not required to be completed by the Local Government Act 1995 and have therefore been flagged as "optional". 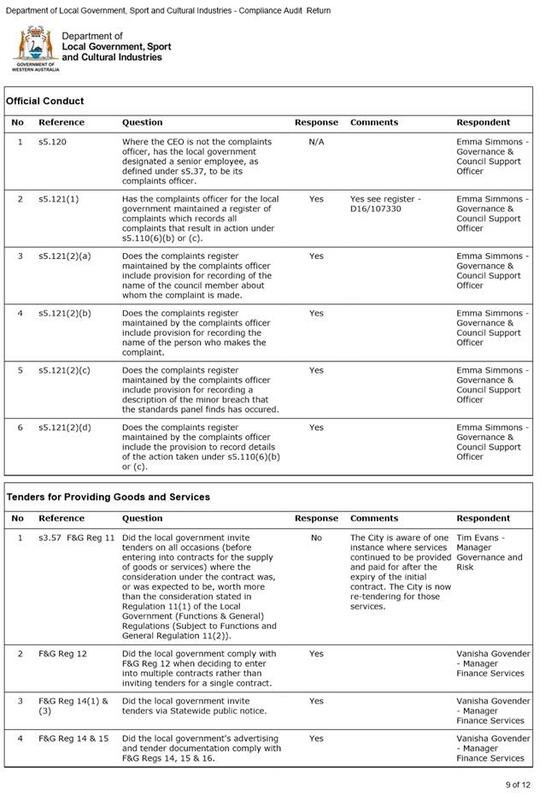 Nevertheless, Administration has answered each of these questions and, while there is no non-compliance, it is noted that the City is currently in the process of developing revised asset management and workforce plans and that the plans that are currently in place have expired. 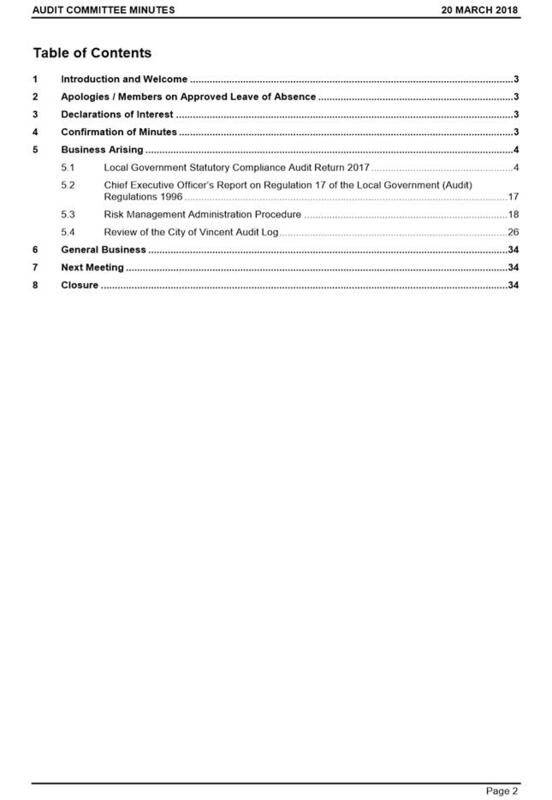 In accordance with Regulation 14 of the Local Government (Audit) Regulations 1996 the Audit Committee must review the completed 2017 Compliance Audit Return and report the results to Council. 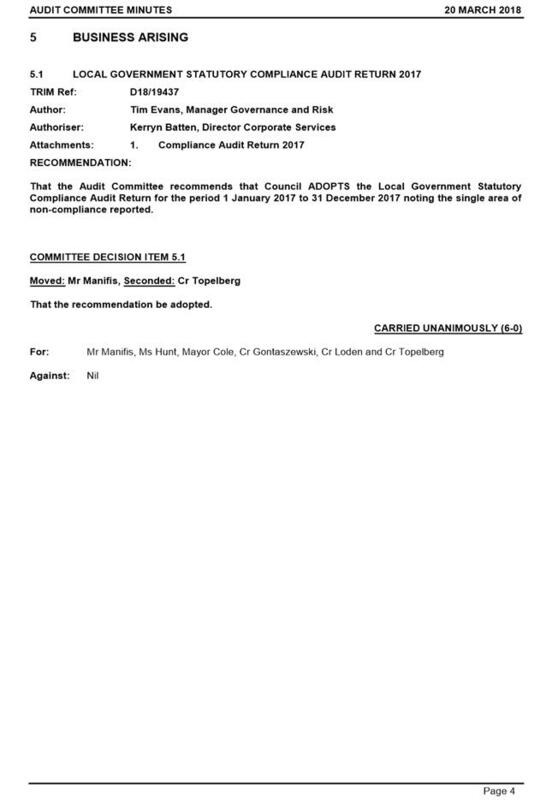 Following Council’s adoption, the 2017 Compliance Audit Return must be submitted to the Department of Local Government and Communities by 31 March 2018. 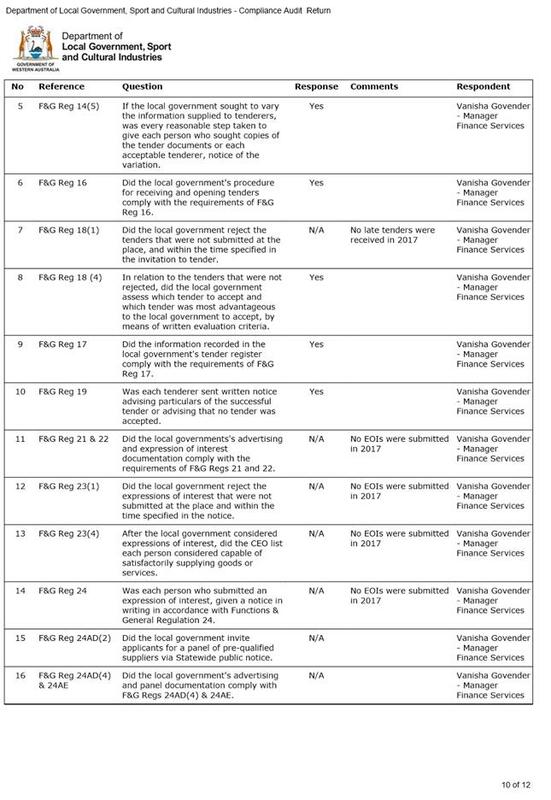 Low: Regulation 13 of the Local Government (Audit) Regulations 1996 requires each Council to adopt the Compliance Audit Return. Failure to do so would be a breach of the Regulations. 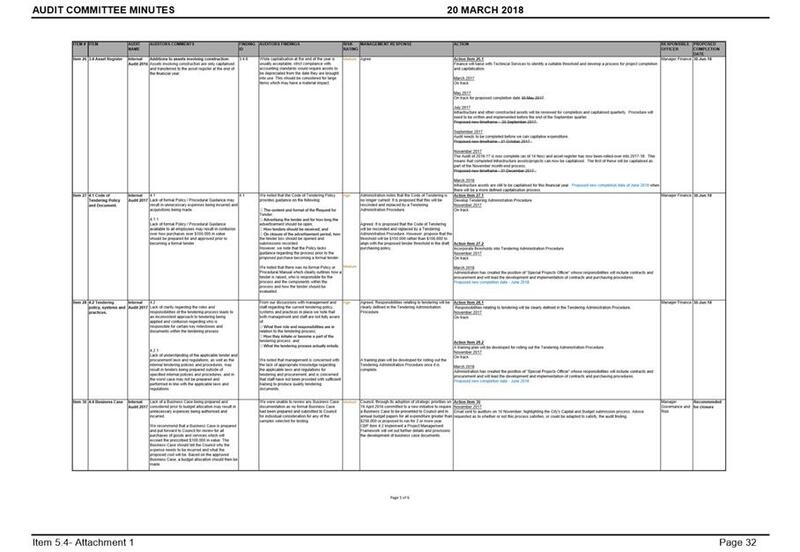 "Leadership, Governance and Management" and, in particular, 4.1.2 - "Manage the organisation in a responsible, efficient and accountable manner". 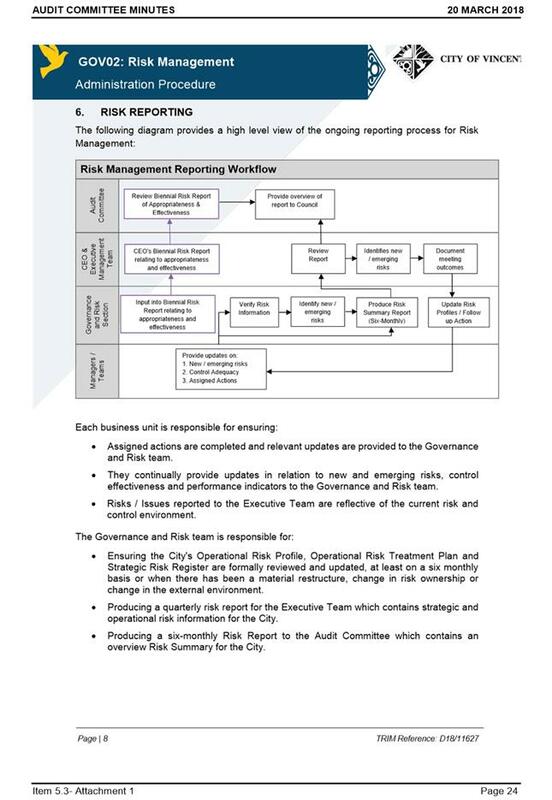 An effect system of compliance auditing helps to ensure that the City is sustainable in the long term. 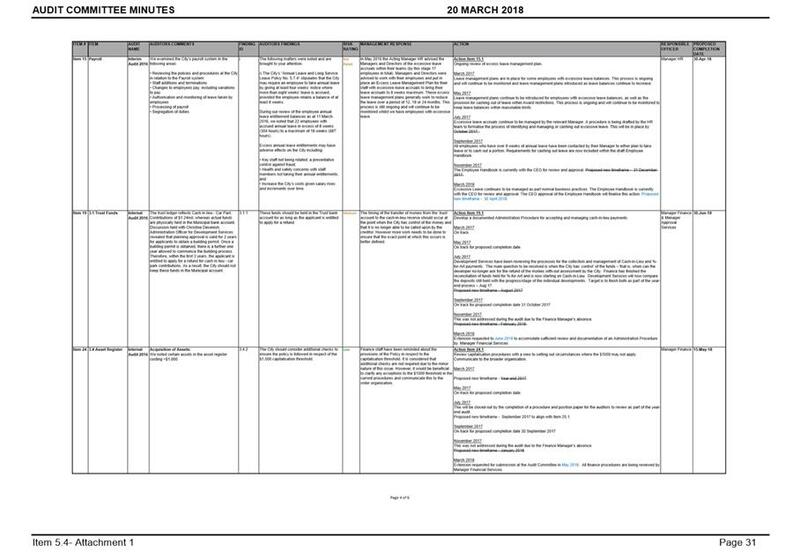 The return is complete and is now required to be adopted by Council prior to being submitted to the Department of Local Government and Communities by 31 March 2018. 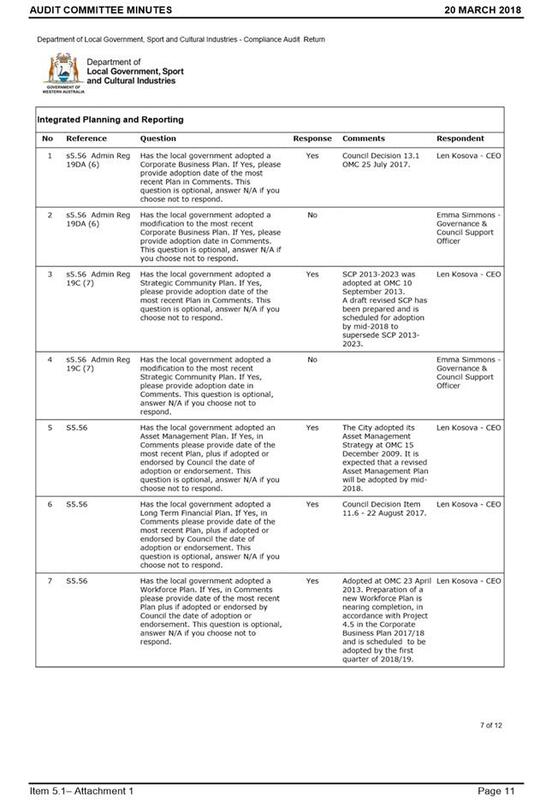 At the 21 Dec 2010 OMC, the following resolution was adopted in part. 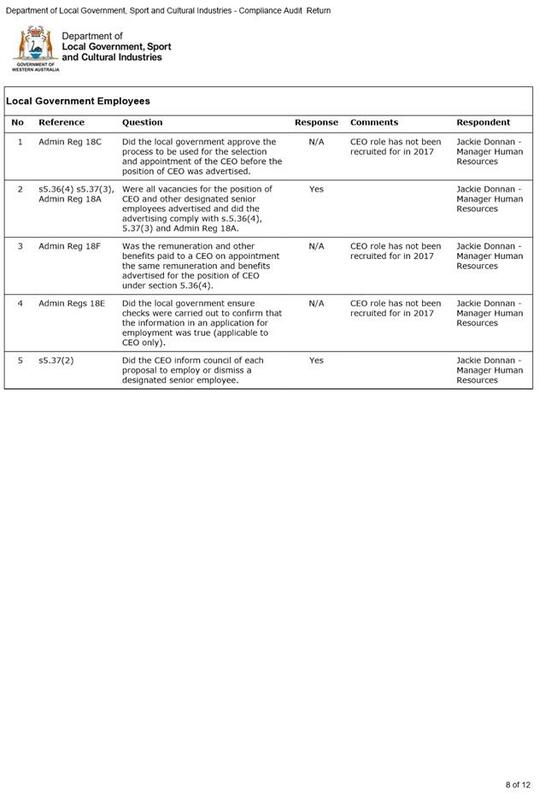 The tender called for a 5 year maintenance contract. The contract is dated 19 January 2011 and provides for a maximum 5 month commissioning period for the ticket issuing machines. 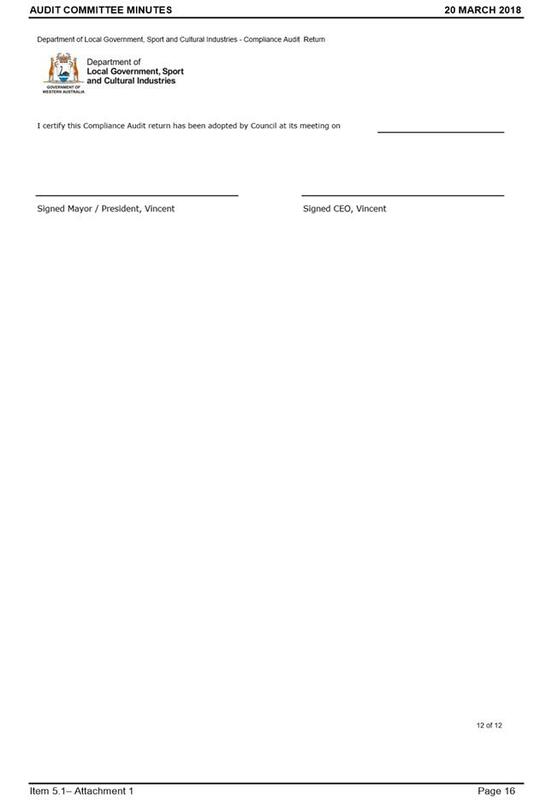 In Clause 5 of the contract (attached) the Contract Period is clearly stated as "five (5) years". 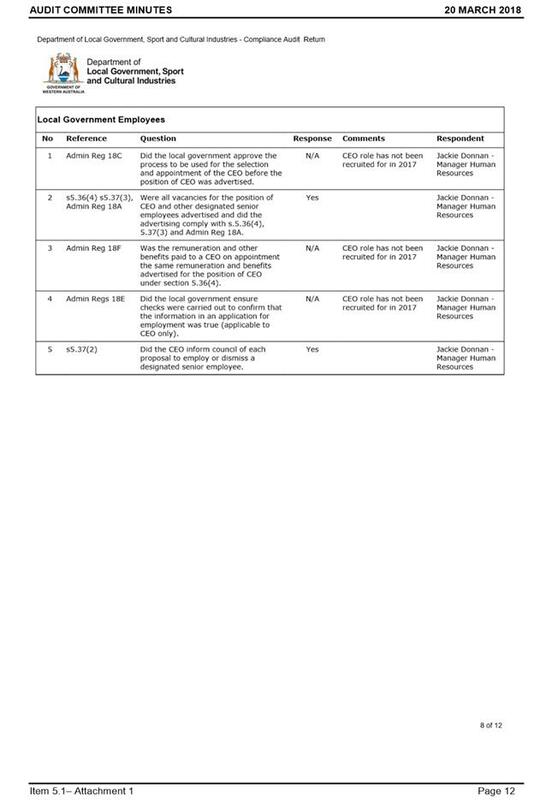 However, section 7 of the contract states "The Town has accepted the rates as shown in Appendix 1 including the additional quote on a fully comprehensive maintenance agreement". The additional quote in Appendix 1 sets out a fully comprehensive maintenance agreement which includes a "7 year warranty" and spare parts for 7 years at a rate of $2,100 per meter per year. 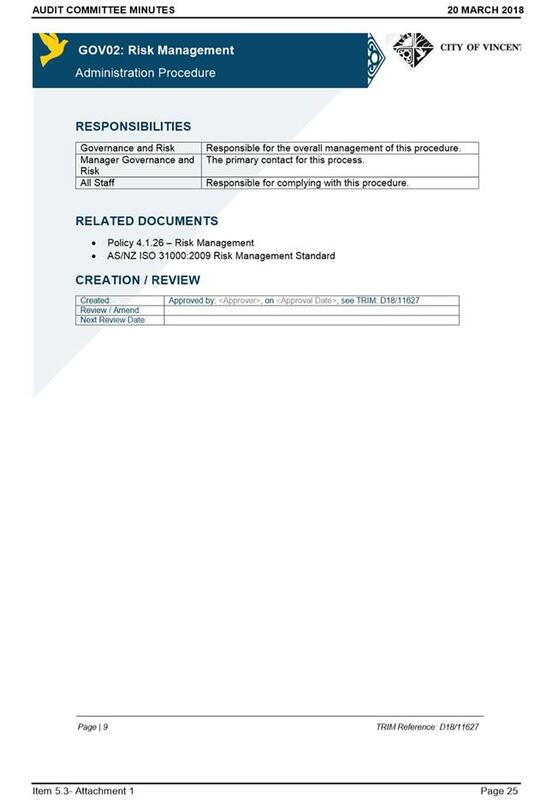 One of the primary causes of this issue was a lack of systematic or automatic contract management systems that would have alerted the Manager and Administration more broadly to the fact that the contract was coming to an end. City resources have now been focussed to address this gap and prevent this situation arising in future. 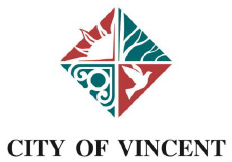 Additionally, the City is currently in the process of re-tendering for this contract which will bring the City back into compliance in this particular case.